H Mercedes-Benz ανακοίνωσε πως με μια SLS AMG Electric Drive έκανε νέο ρεκόρ ηλεκτρικού αυτοκινήτου στο Nürburgring Nordschleife, αφού με οδηγό τον Markus Hofbauer, η ηλεκτρική SLS AMG σημείωσε χρόνο 7:56.234 παίρνοντας το ρεκόρ από το Audi R8 e-tron. Το 7:56.234 κατατάσσει την SLS AMG Electric Drive στο ίδιο επίπεδο με τον χρόνο που έχουν σημειώσει στο Ring η Ferrari California και η Porsche Panamera Turbo. Να θυμίσω ότι η SLS AMG Electric Drive διαθέτει τέσσερις ηλεκτροκινητήρες, έναν σε κάθε τροχό, οι αποδίδουν συνολικά 750 άλογα με 1.000 Nm ροπής. Τα 0-100 χλμ/ώρα τα κάνει σε 3,9 δευτερόλεπτα, μόλις 0,1 δευτ. αργότερα από ότι τα κάνει η SLS AMG με την τελική ταχύτητα να περιορίζεται στα 250 χλμ/ώρα και με την αυτονομία του να ανέρχεται στα 250 χλμ. Ο κάθε ηλεκτροκινητήρας, ζυγίζει 45 κιλά και στροφάρει στις 13.000 σ.α.λ ενώ οι μπαταρίες του χωρητικότητας 60 kWh ζυγίζουν 548 κιλά. Διαθέτει δύο ανεξάρτητα κιβώτια και το σύστημα AMG Torque Dynamics αναλαμβάνει τον ρόλο να στέλνει την ροπή σε όποιον τροχό την χρειάζεται. Λόγω του αυξημένου βάρους των μπαταριών, οι μηχανικοί της Mercedes έπρεπε να μειώσουν το συνολικό βάρος της ηλεκτρικής SLS. Έτσι το σασί της είναι κατασκευασμένο από αλουμίνιο και carbon, με τα φρένα να είναι carbon-κεραμικά διαστάσεων 402 mm μπροστά και 360 mm πίσω. Πατά πάνω σε 19″ ζάντες με ελαστικά διαστάσεων 265/35 μπροστά και 295/30 πίσω. Η παραγωγή και οι πωλήσεις του θα ξεκινήσουν μέσα στον μήνα και στη Γερμανία θα ξεκινά από τις 416.500 ευρώ. The Mercedes-Benz SLS AMG Coupé Electric Drive has lapped the Nürburgring Nordschleife (“north loop”) in a record time of 7:56.234 minutes. 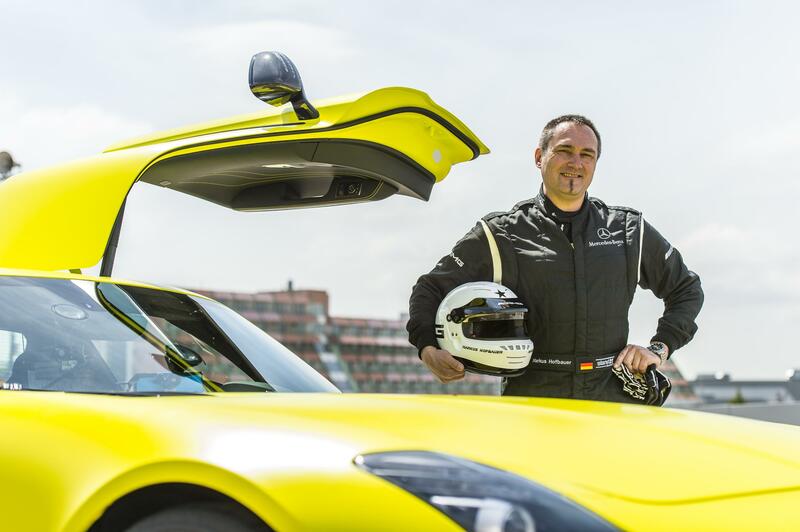 Therefore, the electric AMG super sports car is at the same time the first electrically-powered series production vehicle to have mastered the legendary race track in under eight minutes. The record time of the SLS AMG Coupé Electric Drive has been certified so, two weeks after the first overall win for the Mercedes-Benz SLS AMG GT3 in the Nürburgring 24 Hours, another member of the SLS AMG family has impressively demonstrated its potential on the most difficult race track in the world. “Mercedes-AMG impressively shows the potential of the SLS AMG Coupé Electric Drive with this new record on the Nürburgring Nordschleife. Mercedes-AMG is the first vehicle manufacturer to have circled the Nordschleife in under eight minutes with an electrically-powered series production vehicle. This record run is further proof for our constant innovative vigour,” said Ola Källenius, Chairman of Mercedes-AMG GmbH. “For the first time, an electrically-powered series production vehicle has lapped the Nürburgring Nordscheife in under eight minutes. 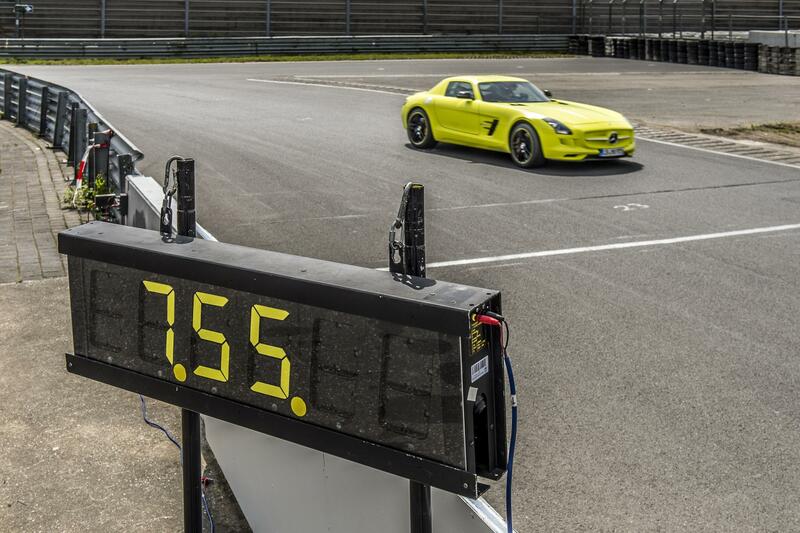 The record for the SLS AMG Coupé Electric Drive in 7:56.234 minutes on the Nordschleife shows the special position of our innovative and unique drive solution. With the extremely efficient battery technology deriving from Formula 1, four electric motors positioned close to the wheels, the individual wheel torques ‘AMG Torque Dynamics’, the SLS eSound and our ambitious ‘AMG Lightweight Performance’ design strategy, the SLS AMG Coupé Electric Drive generates a breathtaking sensation unlike any other model out on the road,” according to Tobias Moers, Head of Overall Vehicle Development and member of the Board of Management of Mercedes-AMG GmbH. 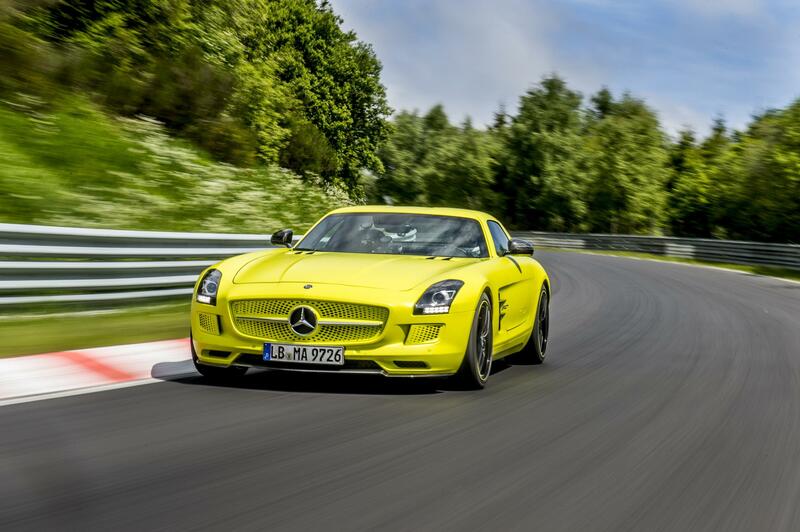 The SLS AMG Coupé Electric Drive, with which Mercedes-AMG set the record on the 20.832 km long race track in the Eifel, corresponds to the series version, which celebrates its launch in June 2013. The strongest current AMG high-performance car has four electrical motors with a total output of 751 hp and maximum torque of 1,000 Nm. The gullwing car is therefore advancing to become the strongest and fastest electrically-powered series production vehicle in the world. The SLS AMG Coupé Electric Drive accelerates from zero to 62 mph in a mere 3.9 seconds and can reach a top speed of 155mph (electronically limited). A new dimension of driving performance – the AMG brand pledge is fulfilled to remarkable effect by the outstanding performance dynamics, which come courtesy of AMG Torque Dynamics and are made possible by the wheel-selective all-wheel drive. 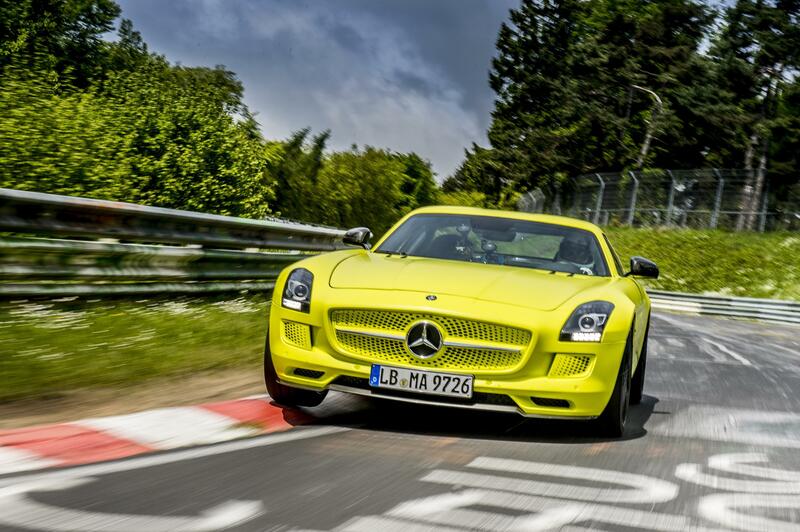 The most “electrifying” gullwing model ever has been developed in-house by Mercedes-AMG GmbH. The extremely powerful high-voltage battery for the SLS AMG Coupé Electric Drive is the result of the collaboration between Mercedes-AMG and Mercedes AMG High Performance Powertrains in Brixworth in the UK and is setting the pace in energy density, power density and efficiency. Here, the British Formula 1 experts were able to draw on their extensive experience with KERS hybrid concepts. The car’s agile response to movements of the accelerator pedal and the linear power output are a source of pure delight: unlike with a combustion engine, the build-up of torque is instantaneous with electric motors – maximum torque is effectively available from standstill. The spontaneous torque build-up and immense power delivery without any interruption in traction on the one hand are combined with completely vibration-free motor running characteristics on the other. Mercedes-AMG has installed a dedicated Manufaktur hand-finishing section for electric vehicles at its headquarters in Affalterbach for final assembly of the SLS AMG Coupé Electric Drive. The electrically powered gullwing model is assembled and readied for operation at a total of seven different stations. The entire logistics process is based in Affalterbach, too. Production of parts such as the exterior and interior initially takes place at the Mercedes-Benz production facility in Sindelfingen. In Affalterbach, highly trained workers take charge of assembling the axles, electric motors, transmissions and cooling system components. Particular care is taken with the installation of all high-voltage components, such as the liquid-cooled lithium-ion battery, the accompanying cables, inverter and control units, and the onboard charger. Needless to say, the utmost standards of safety are applied during all work on high-voltage components. The operational check and extensive final inspection at the end ensure that the manufacturing and product quality offered by the SLS AMG Coupé Electric Drive is of the very highest order. 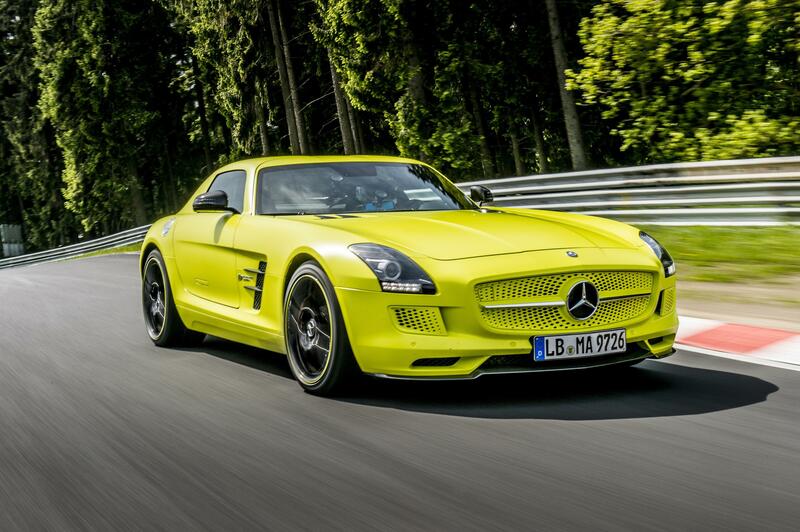 The Mercedes-Benz SLS AMG Coupé Electric Drive celebrates its sales launch in June 2013.